I’m going to confess a deep, dark secret right up front--I went to law school. This was in the Northeast during the second half of the 1970s. In my own defense, though, I must mention that a summer working for a big Wall Street firm cured me of any desire to enter private practice. Senator Inouye opened the interview by saying, “By the time you get to me you probably will get the job, unless you’ve done something bad in the last few weeks. Have you?” I smiled and said, “Well, I’ve taken the bar exam.” He barked, “Did you pass?” No joking with him. The results were months away, but I still replied, “Yes, sir.” I got the position. 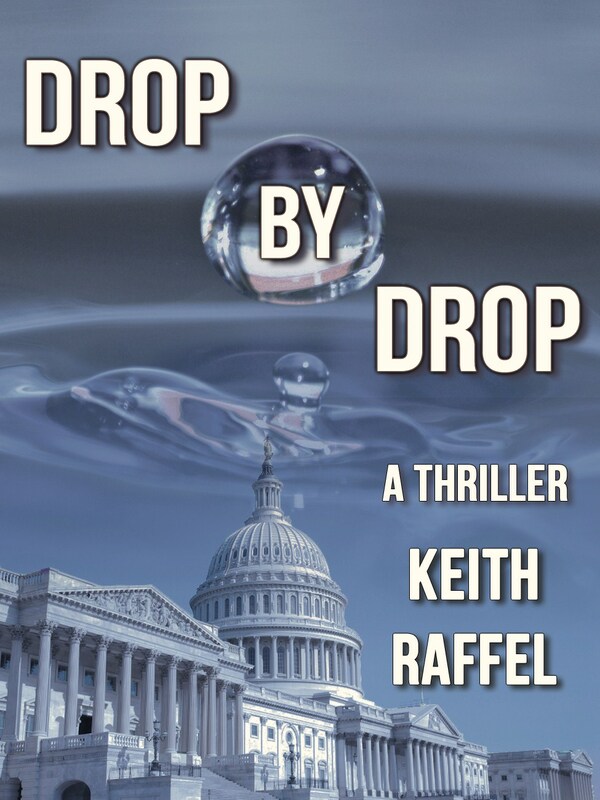 I didn’t realize how much of what happens in my new novel, Drop By Drop, was inspired by my experiences back then till I started writing this “Story Behind the Story” essay. One example: The hero of the book, former Stanford professor Sam Rockman, has to figure out how to shake hands with U.S. President Lucas, who lost his right arm in Desert Storm. You can see why Birch lost his seat in 1981 to Dan Quayle. That result was enough to make me question my commitment to democracy. I still gave my fictional Senator Vincent the same deep commitment to the Constitution and doing what’s right that I saw from Birch in real life. The head of the legislation subcommittee for most of my stint on Capitol Hill was Senator Walter D. Huddleston (D-Kentucky). Unlike almost all his colleagues, he had not run for president, was not running, and had no desire to run. In Drop By Drop I give Senator Vincent that same distinction, as well as the same Bluegrass State background. Huddleston’s staff used to call him “Senator” as if that were his first name. I might get a call from his admin who would say, “Senator wants you up here.” Or I might come up to speak to him and be told, “Senator is on the floor.” I use all of that in the book, too. In the photo below, I’m in the White House with Senator Huddleston. He’d been invited to the Executive Mansion to discuss the legislative charter for the CIA and the intelligence community we’d been working on. He had been told the meeting was for “principals only.” Senator thought that “principals only” was baloney. He figured congressmen and senators were principals--they were elected by the people. By that criterion, the president and vice president were the only principals in the executive branch. In his view the head of the CIA was no “principal”; he was just a staffer, same as I was. “Principals only” was code for excluding congressional staffers and obtaining an advantage in negotiations. Anyway, when Senator stopped his car at the White House gate before this meeting, the uniformed guard noted that he was on the admission list, but I was not. Senator Huddleston said, “If I’m on the list, so is he,” and he pushed down on the accelerator. What a way to inspire loyalty! 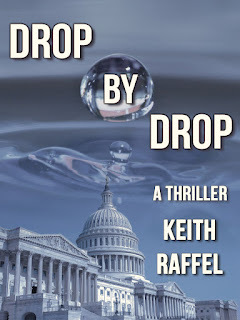 An incident unfolds pretty much that same way in Drop By Drop. A meeting at the White House in 1980. Vice President Walter Mondale sits at the head of the table, with CIA Director Stansfield Turner to his right and Senator Walter D. Huddleston to Mondale’s left. Author Raffel appears in the foreground, on the right. 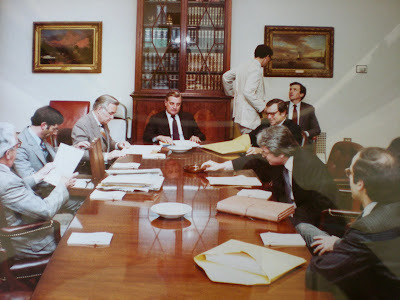 My duties with the committee took me to CIA headquarters in Langley, Virginia, pretty regularly. A fellow in his late 60s or early 70s, whose furrowed, weathered face was protected from the sun by a pith helmet, directed parking at that secure facility. Effusive as could be, he always called me “Senator” when I hopped out of my car, though I promise in those days I looked more nerd than lawmaker. I use a character based on him in the book, as well. A signal accomplishment of the Intelligence Committee in those days was passage of the Foreign Intelligence Surveillance Act (FISA), which set up a procedure to obtain warrants for national security wiretaps. (The law seemed to work fine until the second Bush administration decided to ignore it.) Anyway, I was on the Senate floor during the vote on FISA when Senator Ted Kennedy (D-Massachusetts), co-manager of the bill along with Senator Bayh, asked me for a count. I confess to stealing that line for an early draft of Drop By Drop, but perhaps my conscience eventually got the better of me, because I can’t find it in the final draft. In fact, partisanship on the committee overall was not quite at the level it reached elsewhere on the Hill. Late one afternoon, I heard from then-Senator Joe Biden (D-Delaware) that he wanted to deliver a speech on the Senate floor the next morning concerning a bill I was working on. I stayed up all night drafting and editing. At 9 a.m. the next morning, I went up the senator’s office, speech in hand. His chief of staff told me that Senator Biden had changed his mind about making the speech. I went back downstairs and hurled the binder holding the draft against the wall of my cubicle. A staffer from the other party, whom I rarely agreed with on anything, heard the crash and stuck his head around the corner to see what was going on. I told him, “Three-quarters of what I do around this place is wasted effort.” He smiled and said, “That makes you the most effective staffer on Capitol Hill.” Republican and Democratic staff members even socialized. A colleague from those days tells me she still has a photograph of Fred Thompson, Law & Order district attorney and real-life Republican senator and presidential candidate, taken during a party at my place near Dupont Circle back when Thompson served as special counsel to the committee. Despite the cross-aisle fraternization, I knew no one in the nation’s capital like Drop By Drop’s Cecilia Plant, the smart-as-a-whip, foul-mouthed, hard-drinking, red-haired six-footer who serves as the Intelligence Committee’s majority staff director and the nemesis of Sam Rockman, who works for the minority party. Even though she was smart, my girlfriend back then in D.C. was a tennis-playing dark blonde who, to the best of my recollection, never once dropped an F-bomb. Where did Cecilia come from? My imagination? READ MORE: “Keith 5.0,” by Keith Raffel (Dot Dead Diary). Hi - this behind the story may be better than the story. It was compelling and makes me want to read the book right now! Thank you for all your interesting pieces. I love this! Knowing the story behind the story - I can't wait to read the book. I've been a political junkie most of my life (which is a loooong time) so I know I'm going to love this book. Barbara, being a political junkie can be a manic-depressive condition. (I speak from experience.) Hope Drop By Drop counts on the up side. Let me know. Keith, I remember you telling me some of these stories years ago. You had a rich set of experiences to draw upon for the new book. It promises to be another great read.